Over the past three decades, Sujata Khandekar has led one of the country’s foremost organisations in grassroots leadership and activism: Committee of Resource Organisations, or CORO. Under her leadership, CORO has grown from working on adult literacy in Mumbai’s slums, to a resource organisation on gender and grassroots leadership development. It now focuses on integrated community development, in particular, addressing issues identified by the community itself. Today, CORO runs a programme on domestic violence specifically focused on changing social norms that perpetuate and justify violence against women. It also works on child rights within school and community settings, and has developed a model programme on grassroots leadership development. 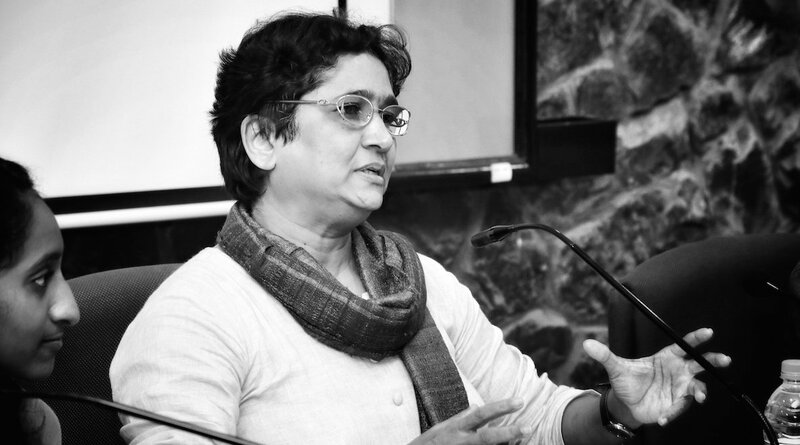 In this interview with India Development Review (IDR), Sujata Khandekar speaks about CORO’s evolution, how the process of empowerment within marginalised communities unfolds, and what it takes to be truly participatory. IDR: How did your journey with CORO start? Sujata Khandekar: CORO was formed in 1989, its origins rooted in the adult literacy movement of the time. The Government of India had just launched the National Literacy Mission, which aimed to impart functional literacy to all non-literate people aged 15-35 years. Under her leadership, CORO has grown from working on adult literacy in Mumbai’s slums, to a resource organisation on gender and grassroots leadership development. As a junior engineer in the Maharashtra State Electricity Board (MSEB), I was deputed to CORO by the Secretary Education, Government of Maharashtra and I joined it as the volunteer representative from two organisations, Stree Mukti Sanghatana—which worked on empowerment of women and Yuva Shakti Pratishthan—which fought for low-cost, clean food for all. SK: Literacy-related work was a big teacher, personally and organisationally. Coming from a middle class, Brahmin background, I had a stereotypical understanding of low income communities, crudely labelling them as ‘slums’. One either hates people living in these communities or pities their conditions, but there’s never a sense of equality or connectedness with them. IDR: So how did CORO’s work evolve? Why did it become women-centric? SK: Women from the community were largely non-literate; and unlike men, they did not hesitate to admit it. So, we started working more with them. IDR: Was that a turning point for you? SK: There were many turning points, but I distinctly remember two in the early 1990s. The first was when CORO helped the community access the public distribution system. When women started writing complaints, shop owners began pleading with them to rescind them. This was pivotal; it made women realise the power of their words. IDR: Was that then the beginning of your work on grassroots leadership building? IDR: How did your work grow? Can you speak about ‘organic leadership’ at CORO? SK: We saw early on that people at the grassroots were the changemakers. But ‘beneficiaries’—as we call them—are never recognised as such. We wanted to shift this paradigm. IDR: Where is the grassroots leadership programme today? SK: We have run the fellowship programme called Quest in Maharashtra for the last 10 years, and Rajasthan for the last three. We have also had one cohort in Delhi, NCR. We’ve worked with more than 280 nonprofits and community based organisations (CBOs) across these states, with participation from more than 1,300 grassroots leaders. It’s important to recognise one’s disempowerment. Without this, it’s impossible to embark on an empowerment journey. IDR: So, what’s next for CORO? SK: We are keen to use our experience with the grassroots leadership development programme as a foundation for a national grassroots centre that aims at shifting power dynamics in favour of the grassroots, primarily in leadership, in organisation building, and in knowledge building. Rachita Vora is Co-founder and Director at IDR. Before this, she led the Dasra Girl Alliance, a Rs. 250 crore multi-stakeholder platform that sought to empower adolescent girls in India. Her writing has been featured in the Guardian, Stanford Social Innovation Review, Next Billion and Alliance Magazine. Rachita has an MBA from Judge Business School at Cambridge University and a BA in History from Yale University. Smarinita Shetty is Co-founder and CEO at IDR. She also co-founded Netscribes–India’s first knowledge process outsourcing firm. Her work and opinion have been featured in The Economist, Times of India, Mint and The Economic Times. Smarinita has a BE in Computer Engineering and an MBA in Finance, both from Mumbai University.